The San Jose Sharks visit the Tampa Bay Lightning for Saturday NHL action. The surging San Jose Sharks were flat in a 6-3 loss at Arizona on Wednesday which ended a seven game winning streak. Kevin Labanc, Evander Kane Logan Couture provided the offense for San Jose. Kevin Labanc also had a pair of helpers and Aaron Dell gave up four goals on 39 shots to get the loss for the Sharks. The balanced Arizona offense saw scoring off the sticks of Lawson Crouse, Richard Panik, Christian Fischer, Oliver Ekman-Larsson, Alex Galchenyuk and Josh Archibald. Clayton Keller added two helpers and Darcy Kuemper gave up three goals on 29 shots to pick up the win for the Coyotes. The Tampa Bay Lightning had a rare ‘off’ night in a 4-2 loss to visiting Toronto on Thursday. 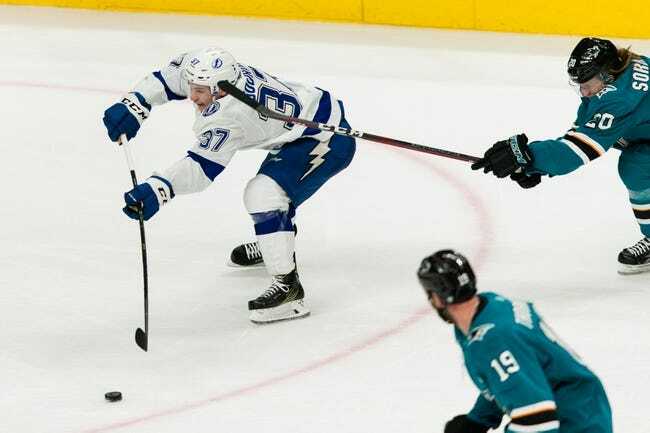 Brayden Point and Victor Hedman provided the scoring for the Lightning with both getting assists while Andrei Vasilievskiy allowing three goals on 30 shots. The balance Maple Leafs receved scoring from Nazem Kadri, Patrick Marleau, Mitch Marner and Zach Hyman. John Tavares and Nikita Zaitsev gave Toronto two assists each and Frederik Andersen made 36 saves to get the win. Sharks are 6-0 in their last 6 vs. Eastern Conference and Sharks are 5-0 in their last 5 games playing on 2 days rest and Sharks are 4-0 in their last 4 vs. a team with a winning record. Lightning are 6-1 in their last 7 Saturday games and Lightning are 5-1 in their last 6 vs. Pacific and under is 4-1 in Lightning last 5 vs. a team with a winning record. Sharks are 4-1 in the last 5 meetings in Tampa Bay and over is 12-3-1 in the last 16 meetings and over is 5-2 in the last 7 meetings in Tampa Bay.